In 2000, a stifling heat blanketed many parts of Korea for months, triggering severe water shortages especially in rural areas and islands. Then he began delving into a technology called rainwater harvesting, where rain is collected from relatively clean surfaces such as rooftops, rocks or the ground and stored for later use. In 2001, Han set up the Rainwater Research Center, a first of its kind here, at SNU where he teaches civil and environmental engineering. He has since then been advising central and local governments in Korea and proving free consultations for agencies and institutions in water-scarce developing countries to help them adopt the method. 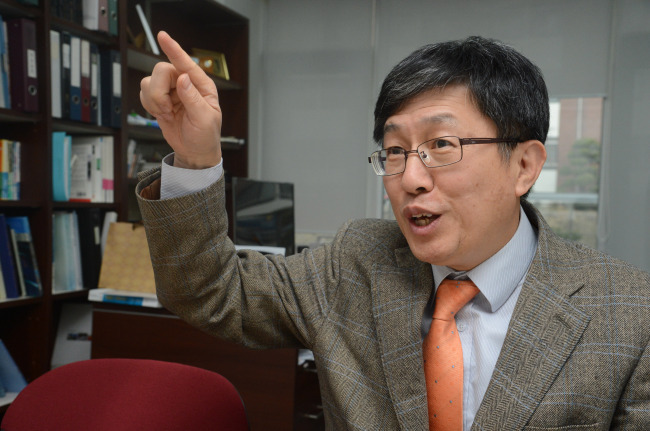 According to the professor, rainwater harvesting is the “most affordable yet far-reaching solution” to many water-related problems compared with other alternatives like groundwater extraction and seawater desalination, especially in countries with seasonal thunderstorms and torrential downpours such as Korea. “Currently, when it rains all cities let it run off into the street. But when dry weather is prolonged they struggle with water shortages and pump billions of dollars into expensive systems that sometimes do harm to the environment,” Han said. Rain is a clean, salt-free source of water that contains a slew of ingredients crucial for life, including such minerals as sulfur and potash and other beneficial microorganisms. 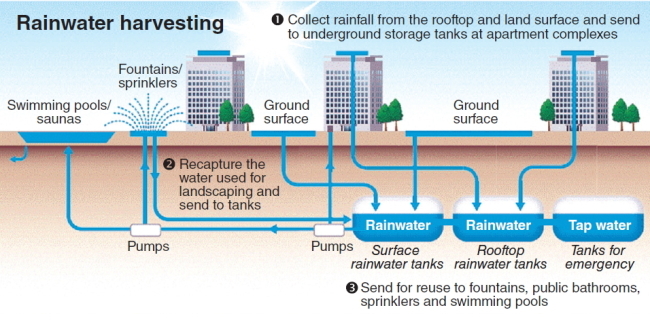 Rainwater harvesting has been widely used over some 4,000 years, chiefly in arid regions such as the Middle East and Africa, providing water for drinking, farming, livestock, gardening, toilets, laundry and other uses. The method has in recent years reemerged as a cheap, easy way of saving water in the face of global warming, relentless development and subsequent desertification. Han is particularly setting his sights on rooftops as the prime catchment tool as they are less contaminated, easier to collect rainwater from and closer to people than other sources. Once it rains, the water is then transferred through gutters, downspouts and pipes to a storage tank, either belowground or above, which is equipped with biofilms or another simple purification system. Relatively large debris such as leaves, dirt and bird feces can be initially sifted out by tools like a diverter chamber or mesh screen inside the downspouts. “Roofs are the cleanest water factories in the world and their products have a crystal clear origin and go through a transparent distribution process,” Han said, dismissing stereotypes about the safety of rainwater such as consisting of acid rain, yellow dust or finer particles like PM 2.5. And rainfall contains less acid than everyday drinks like cola and orange juice and is cleaner than chlorinated tap water, he said. During a recent on-campus blind test hosted by the research center, the highest number of participants picked rainwater over bottled mineral water and tap water as the tastiest. But the technology’s domestic availability remains undercut by what Han sees as vested interests in bureaucracy and related industries. “I am talking about a water-treating apparatus that is almost free thanks to gravity. This threatens the job security of public officials and businesses operating in a huge market for things like desalination plants,” he said. To boost the use of rainwater, Han calls on state agencies to break down barriers between them and give greater autonomy to local governments in formulating their water policies. Though a 2010 law on the reuse of water paved the way for rainwater harvesting to be expanded, the government and companies have so far focused on more costly sources such as sewage and wastewater, he noted. “We should tighten the legislation’s enforcement with regard to rainwater and scrap the dualized policy of flood control and water supply,” Han said.